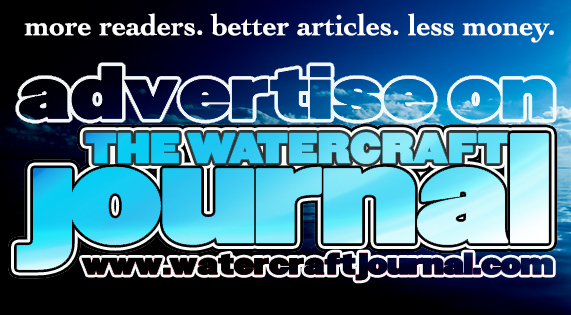 Real Review: Jettribe's RS-16 Race Vest | The Watercraft Journal | the best resource for JetSki, WaveRunner, and SeaDoo enthusiasts and most popular Personal WaterCraft site in the world! When it comes down to it, which is more important: features or fitment? I know for myself, and to the chagrin of my wife, I would much rather trudge around in a faded t-shirt, heavily broken-in jeans and a tattered pair of tennis shoes than say suit up in dress pants, a fitted buttoned-down shirt and some polished leather shoes. 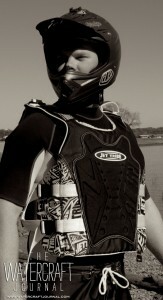 Jettribe’s RS-16 Race Vest was designed – and is best suited – for athletically-built closed course racers. Larger casual riders might tend to find the fitment less than favorable. Sure, I might prefer to look a little less presentable, but at least I’m comfortable, right guys? Now everything has its time and place and I wouldn’t want to attend a wedding or go to court in my usual kick-around clothes, but if there was only a way to have my cake and eat it too, I’d be a happy camper. 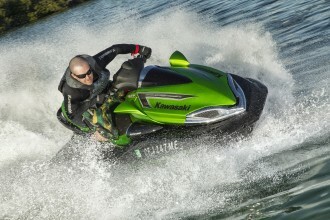 The same philosophy translates to PWC riding gear, in fact, almost more so. We’ve all been on rides with friends who continue to wear a ridiculously sun-bleached vest, it’s retro purples and yellows dimmed to near-unrecognizable hues. When asked, their answer is always the same: “It fits great.” Men are like that. We would rather be comfortable than anything else. So when reviewing Jettribe’s RS-16 Race Vest we had to weigh it appropriately. 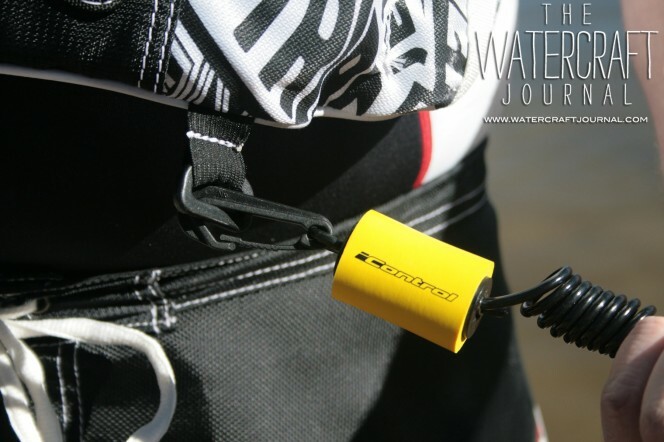 Like so much of Jettribe’s race-prepped riding gear, you’re going to see more included features than you can count. One of the best attributes of a company with such an active racing program is Jettribe’s propensity to listen to the suggestions of their racers as well as race officials and safety crew. 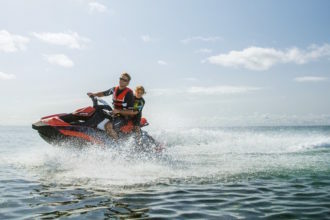 The result is a line of products that meets (if not exceeds) the standards for durability, safety and protection. The RS-16 Race Vest is no different. Very similar in design to other side-entry race vests from JetPilot and Slippery, Jettribe’s RS-16 has a large single piece of compression molded foam for impact dissipation in front and back with an improved outer shell material for added protection. Where the RS-16 could benefit from foam molding, it shines in additional features like lanyard buckles, Velcro-nationality flag on the shoulder and impact resistance and protection. Using a proprietary CFM material exclusive to Jettribe, the RS-16 also features dual 38mm quick-release right-hand buckles which can be exchanged with other buckles. Other bonuses include a built-in lanyard attachment and Velcro-attached interchangeable flag patch. 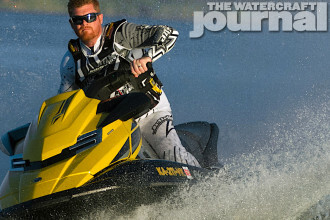 Designed for racing, the RS-16 also features this innovative rescue handle for pulling downed riders out of the water. We hope you never have to use this. But most iconic to the RS-16 is its built-in rescue harness. 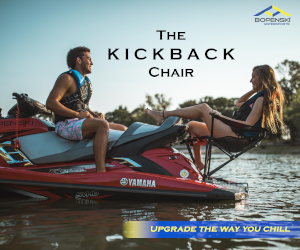 Sown into the left shoulder, the handle grip allows for the “easy retrieval of downed rider during a race.” The feature has been recognized by the IJSBA, APBA, and TJSBA Rescue Course Marshals. 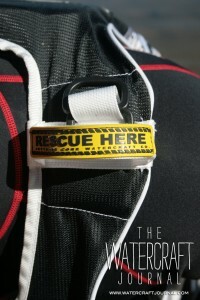 The RS-16 is also designed to seamlessly integrate with Jettribe’s race collar harness. But where the long list of features ended, the fitment concerns rose. Let me begin by saying that I’m 6’2″ and 220-pounds. More lean, athletically-built riders might find the fit more encompassing, but for 85-percent of Americans who are toting a few extra pounds, it leaves much to be desired. The thick impact-resistant foam panels in front and rear are nearly slab-straight, making the RS-16 feel a little like wearing a sandwich board. No matter how tight I cinched the plastic buckles, the vest never felt form-fitting. My sides were always exposed to the nylon straps, which when worn without something underneath it, caused considerable chaffing. It’s also worth noting that the RS-16 has yet to receive the blessing from the USCG, which can deter those who regularly ride offshore. Frankly put, this vest isn’t meant for everyone, and its fair to say Jettribe designed it as such. Since it’s DNA traces directly to closed course racing, it’s best used there.